I’ve always wanted to be deep, serious and mysterious. Instead I’m goofy, spacy and obvious. Don’t get me wrong, I like who I am, but it doesn’t stop me from daydreaming that someday I might be mistaken for an international spy (who just happens to be holding a 3-year-old as part of a complex disguise). It’s similar to the cloudy, dreamy hope I have every Sunday at mass that the person in front of me, after hearing me sing, will turn around and exclaim breathlessly, “Wow, your voice is incredible! You should be in the choir!”. Ya— that’s just not going to happen, but I keep on dreaming. 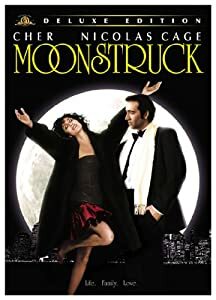 Last night I was in my, “I’m deep and serious” mode when I went into confession but quickly slipped into my usual squirrel behavior, got off on a tangent and ended up trying to reenact the confession scene from Moonstruck for the Priest because amazingly he had never seen it! Fortunately he graciously put up with my poor performance promising he would watch the movie later to experience the actual entertainment of the scene I was destroying. And then …I spent the rest of the night… kicking myself for acting out the confession scene from Moonstruck during my deep and serious confession. What was I thinking? How can I ever be taken for a mysterious International Spy at this rate? I was upset at myself. I realized this morning I was upset because I was caught up (again) in the spiderweb of perfection. I had lost focus of the goal of Lent and instead had become hyper-focused on my ability to pray perfectly, praise perfectly, make perfect decisions, treat others perfectly, treat myself perfectly, confess perfectly, be the perfect wife, mother, friend etc. etc. An exhausting course with an obvious outcome of no, not really, not even close, nada, zip, zilch, never, ever, in a gazillion light years will I ever be perfect. This may be a surprise to many, even apparently myself, but Catholicism isn’t about being perfect. In fact, I have a crazy hunch I’m not the only one out there caught up in the perfection spiderweb this Lenton season.